Topics: Childrens Quilts, Full Sized Quilts, Table Runners, Wall Hangings, & Cute Quilting Buddies. 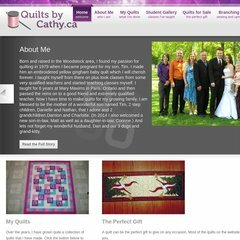 quiltsbycathy.ca Quilt Shops - Quilts by Cathy.ca - Home - Hand made quilts ..
quiltsbycathy.ca A Quilters Last Will and Testament - Quilts by Cathy.ca - Home .. The programming language environment is PleskWin. It is hosted by Softlayer Technologies Inc (Washington, Seattle,) using Microsoft-IIS/6 web server. PING (50.23.154.202) 56(84) bytes of data.